KANPUR: Illegal fishing in the National Chambal Sanctuary is killing endangered gharials like the one found dead in the Chambal river in Etawah on Thursday last. The tragedy continues unabated despite the fact that now there are very few gharials left in the region. The gharials (Gavialis gangeticus) have been declared as a 'critically endangered specie' by the International Union For Conservation of Nature. The National Chambal Sanctuary, which falls in UP as well as Rajasthan and Madhya Pradesh, is a known as a habitat for the endangered gharial and other aquatic animals. It is spread in an area of 5,000 sq km. Experts say illegal fishing, using boat and synthetic net, is posing a serious threat to the endangered gharials nesting in the sanctuary. Only on Monday, a 16-ft-long gharial was found hacked into pieces at Lal Pura Khar in Bhareh area of Etawah and on Monday a boat and a large synthetic fishing net was seized by the forest department personnel of the National Chambal Sanctuary. Such illegal practices are still on despite a ban on fishing by authorities in the sanctuary to ensure the safety of the aquatic animals. There is an urgent need to check the rampant killing of gharials and other rare aquatic animals, including dolphins and turtles and to strictly enforce the ban. Nesting of the endangered gharial have recently been sighted along the Chambal river, at present, there incubation period is underway and hatching of egg is expected to take place in the last week of May or first week of June, the National Chambal officials said. 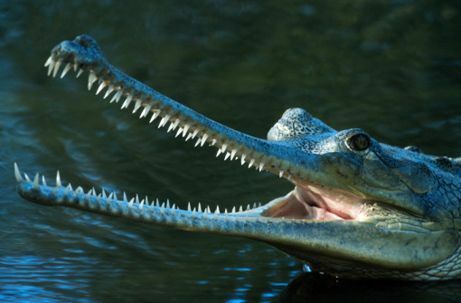 "The female gharial lays 30 to 40 eggs in each nesting site. These eggs are incubated and hatched due to sand's heat. 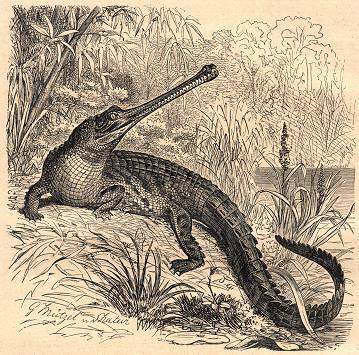 Then the baby gharials emerge from their eggs and creep into the river," the expert informed. "Areas known for the notoriety of hunters start from Panchnada to Bansuri, which is nearly a 15 km of stretch, then from Siddhbaba temple upto Pali, a 6km spread of land downstream, besides from Barchauli to Kasauwa, Ranipurwa to Lakhanpurwa and from Gati to Kheda," said a forest department official. Most of these reptiles are victims of by-catch in fishing nets. Sand-mining also poses one of the most significant threats to gharials, Gangetic dolphins and turtles in the Chambal sanctuary. "What is more shocking is that these endangered aquatic species are being killed by fish poachers as these reptiles become victim of by-catch. Sand-mining is other illegal practice within the sanctuary, but there is no one to check those involved in the illegal trade," says Rajiv Chauhan, secretary, Society for Conservation of Nature. He further informed that earlier there was a guard especially employed for guarding gharials in the region but the post has been lying vacant since the past eight-nine years following retirement of the previous staff. Fishermen are active both in the upstream (Madhya Pradesh) and downstream in (Uttar Pradesh). Another wildlife enthusiast claimed that big contractors are in cahoots with local fishermen and use them for fishing. "Such contractors are least bothered about the welfare of the environment and are using every possible means available to earn quick money," he said. "This is a big problem and there's a lot of manpower needed to trap these illegal fishers. However, we will leave no stone unturn to check the illegal fishing practice to save endangered species," says Uma Shanker Dohre, Wild Life warden, while talking to TOI. In 2007, from November till March 2008, more than 112 gharials died in the Chambal due to unknown reasons. Further investigations by the IVRI suggested the possibility of poisoning by metal pollutants. Just 200-300 gharials are believed to be left in the Chambal and Katarnia Ghat. All over India, there are 2,000-3,000 gharials left.